No build thread for this one. 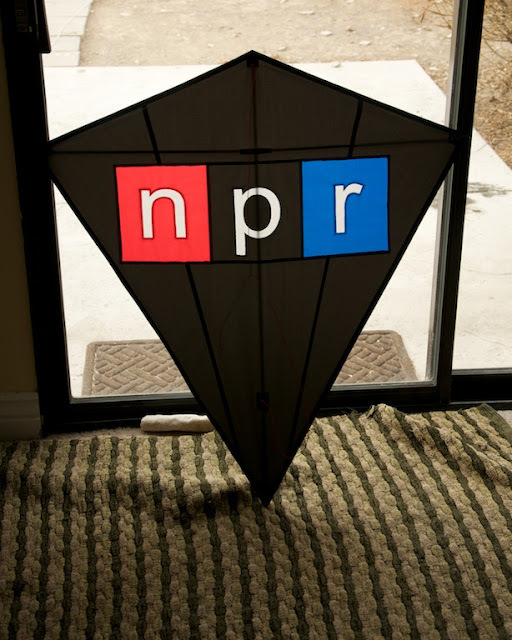 I built this for my wife who loves NPR. (This was her birthday present last February... I just finished it today... ). This was my first go at appliqué work. Some rough edges on the cutting end of things, but not to bad for this simple design. Errr Just what is NPR? Hope she is listening to NPR when she will be flying. one question, could you use a small circular 1/2 inch thick bit of closed cell black foam placed behind the black center of the P between the sail and the frame to get rid of the spine shadow through the letter? just a thought. nice piece of quality work, well done. Like I always tell people making a kite who are saying they made a mistake "You are the only one who will see that kite from that close", I feel the same way when a judge is looking at a kite through a jewlers rouge "Dude ... it's a kite, it'll be seen at 50 feet away or more, step back"